Summary: Nine-year-old Audrey Hendricks, inspired by civil rights leaders who visit in her home and preach at her church regularly, decided to stand up against injustice. When Martin Luther King and others planned a children’s march in Birmingham in 1963, she volunteered to be a part of it. Because of her brave actions, she was jailed along with thousands of other African-American young people. This protest, and others like it, helped to get the Civil Rights bill passed, and made it possible for people of all races to have access to the same places. Literary elements at work in the story (Genre/setting/characterization/plot/theme/point of view/style): This true story is able to bring the complicated story of the Civil Rights movement to a level that children can really understand, and even feel some of the injustice right along with Audrey. The perspective of Audrey – expressed in both words and pictures – is especially poignant when she realizes she is the youngest person at the march, and then as she finds herself alone and sad in jail. Her perspective on incidents such as the children sprayed with fire hoses, along with the subtle black & white illustration of that incident, gives children a taste of the suffering, without making it unbearable for them to think about. Both illustrations and words also show the joy of her reunion with her family, and the sacramental “hot rolls, baptized in butter” that greeted her when she returned home. There are elements in this story that most children can relate to – such as family meals, the game her Dad bought for her to take to jail, a hug from her grandparents. These simple and familiar elements create a window through which a child can see this courageous story that otherwise might be “larger than life.” Children can hopefully see Audrey as someone not totally unlike themselves, which may let them then imagine ways they can stand up to injustice, as well. For readers who want a little more history, the book includes some biographical detail at the end (along with a recipe for Audrey’s mother’s special rolls!). How does the perspective on gender/race/culture/economics/ability make a difference to the story? The story focuses on racial inequality and the struggle to integrate “Black and white together, like we belong.” The story also celebrates strong female characters, and strong young characters (most notably Audrey herself) who heard the call of the civil rights leaders to stand up against unjust laws and chose to take action. Theological Conversation Partners: Deuteronomy 21:6 says “Be strong and courageous. Do not be afraid or terrified because of them, for the Lord your God goes with you; he will never leave you nor forsake you.” To me this is the perfect passage to describe the events of Audrey Hendricks’ life that are recorded in this book. While the book doesn’t focus on God explicitly, you can see that her life and her actions are rooted in her faith. She hears the call to protest in the context of worship, and she is surrounded by Civil Rights giants, who discuss issues of faith and politics around her dinner table. This is a story of courage based on faith in God and in doing what is right. Other verses that are called to mind include Micah 6:8 and Amos 5:24. What were some of the unjust laws Audrey wanted to change? If you had been at the church when Dr. King called for volunteers to go to jail, what do you think you would have done? What do you think was hardest for Audrey about being in jail? How did her actions help bring change? Where do you see God at work in this story? This review was written by Edye Bender, Direector of Programs at Faith Presbyterian Church, Indian Land, SC. 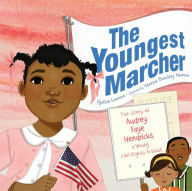 The Youngest Marcher: The Story of Audrey Faye Hendricks, a Young Civil Rights Activist by Storypath is licensed under a Creative Commons Attribution-NonCommercial 4.0 International License.